Property Size 1,092 sq. ft. This Moose Hollow condominium #1206 is perfectly located in the heart of all your year-around outdoor adventures. This elegantly decorated condo sleeps 8, and overlooks the many beautiful views of Ogden Valley. 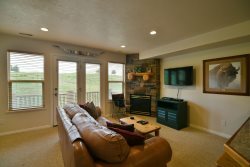 Just inside the door, is a family living area with a sofa sleeper and French doors that open to a deck with views of the Hot Tub and grand views of the surrounding valley, mountains and lake. A gas fireplace and TV/DVD in the living area provide entertainment and relaxation. The living room is open to the fully equipped kitchen. Down the hall is a bedroom with a queen bed and French doors over looking Moose Hollow and it has an adjacent full bathroom which is also available to the living area. Upstairs is a cozy master suite with a king size bed and a trundle couch that transforms into 2 twin beds. There is also a large private full bath. Fantastic team! Or shower curtain broke and Greg was there to fix it immediately. Beautiful property! Lots of fun sledding and building snowman. We were able to watch the fireworks over Nordic Valley. Definitely a must visit again!